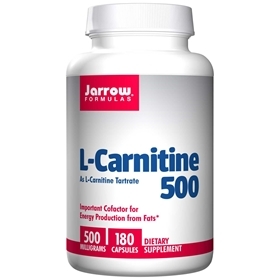 L-Carnitine is an amino acid found in high concentrations in heart and liver tissues where, inside the cells (mitochondria), L-Carnitine helps transform fats into energy. L-Carnitine also facilitates the metabolism of carbohydrates and enhances ATP (i.e., energy) production. L-Carnitine works synergistically with Co-Q10, an antioxidant and energy cofactor that is found in the inner membrane of the mitochondria. Take 1 capsule up to 2 times per day or as directed by your qualified health care consultant. Cellulose, silicon dioxide and magnesium stearate (vegetable source). Capsule consists of hydroxypropylmethylcellulose.